Kool Deck Elite is the newest addition to the concrete topping line from Mortex. This elite product shares all the benefits you have come to expect from the genuine Kool Deck surface, like significantly lowering the surface temperature of concrete and being environmentally safe, but now has an enhanced formula! 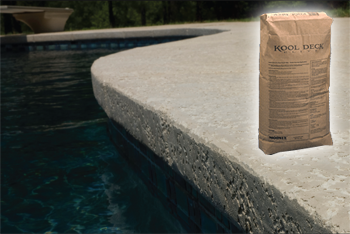 Kool Deck Elite's pre-mixed packaging makes for easy bucket mixing! Also, ask your Export Manager about Drainage, Control Joints and Cantilever Forms by Mortex.